A group of Onekama High School students recently took to the seas. Each school year since 1993, Onekama High School science students, under the supervision of their teacher Jim Hunter, take samples from three dedicated sites in Portage Lake. The study is quite literally supported by the school’s administration; it takes place aboard the fishing boat of Onekama Superintendent Kevin Hughes and he serves as the captain of the student crew for the study each year. The purpose of the Portage Lake Water Study is to produce and update a report on the condition of Portage Lake as a continuation of a lake study conducted by the Snell Environmental Group on behalf of the Michigan Department of Natural Resources and the Village of Onekama. The study is centered around six measurements that students collect and test: dissolved oxygen levels, total phosphorus, chlorophyll-a, pH, clarity, and the temperature profile. The lake is tested twice a year, in the fall and spring. More than 300 students have participated in the testing of the waters of Portage Lake for this project over the past 17 years. 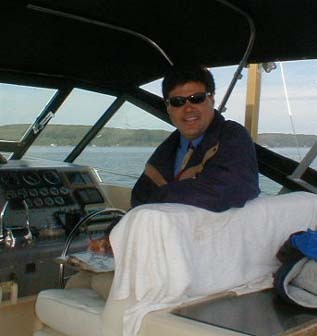 However, the scope of individuals impacted by this project is far greater than the students who conduct the testing – by preserving the quality of our waters, Onekama students are positively impacting the lives of everyone who lives, works, and spends recreational time in the 21 square miles, or 13,300 acres, encompassed by the Portage Lake watershed. 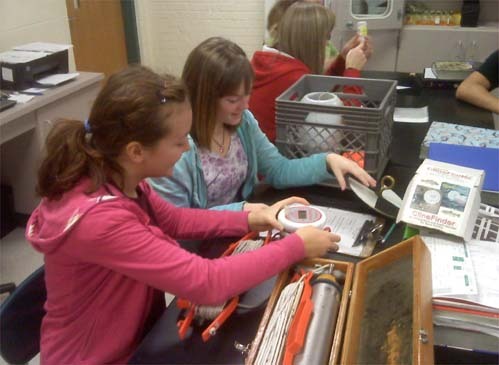 Before the trip, Claire Harvey and Emily Jean Bergren prepare testing equipment to take out onto Portage Lake. Onekama Consolidated Schools supports the belief that learning that takes place in real world situations and that serves the community is the richest form of learning possible. Through projects including the Portage Lake Water Study, students develop a sense of stewardship in regards to natural resources, including Portage Lake and Lake Michigan. Sophomore Curtis McKenney agrees: "I feel it is important to actually do science and not just read and take notes about scientists and scientific facts. It was neat that what we did with the lake study actually gets used by those in the community concerned with the condition of Portage Lake." Seconds Barnard, “Portage Lake is a wonderful asset to our community and we should protect it for future generations." 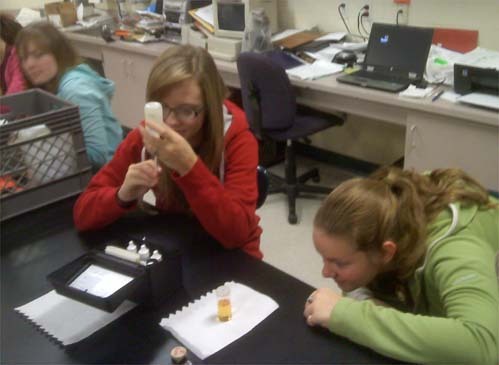 Back in the classroom, Emily Barnard and Kelly Koon test the dissolved oxygen content of a sample from Portage Lake.